Sweetheart, I know you know I know how hard it is. But honestly, time waits for no man (or woman, or beast), so if you still want to enter to win crack that whip! By whip I mean pen, you naughty fool. In honor of my new book Fairies, Pookas and Changelings: A Complete Guide to the Wild and Wicked Enchanted Realm, I’m running a little contest throughout the month of April. Here’s how it works. I give you the following intro paragraph and you finish the tale, in 500 words or less (ideally). Submit your entry anytime between the hours of 12:01 a.m. on April 1st through midnight April 30th. Please keep entries to 500 words or less. You can change the pronoun to any gender you please. Entries must be copy and pasted into the body of an email. I will not (I simply cannot) open attachments. Should your entry be chosen fear not: we will go through a basic editorial and approval process that involves attachments. You will retain all rights to your work, however the intro as I have written remains my own. In other words, should you want to republish the work elsewhere, you would need to change the introductory paragraph after the contest is over or just indicate it was written by me. I’m going to put my faith in your ability to do the right thing here. First Place wins a complete set of my three Magical Creatures books including Fairies, Pookas and Changelings; Among the Mermaids and Banshees, Werewolves and Vampires along with a box full of strange and wonderful things customized for you by me. The story will be published on varlaventura.net and publicized by my team. Second place: a signed copy of Fairies, Pookas and Changelings: A Complete Guide to the Enchanted Realm. The story will be published on varlaventura.net and publicized by my team. Third place: There is no third place. Okay, now darlings, get writing! Copyright Varla Ventura/Weiser Books 2017. Wild Thoughts of the Fairy King: Ghost Chronicles, Tonight! 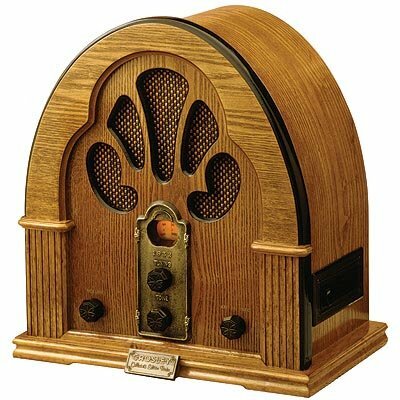 Join me and the lovely hosts of Ghost Chronicles, Ron Kolek and Anne Kerrigan, as we gather round the radio-machine to discuss all manner of creatures real and imagined. Tune in live tonight, Wednesday, March 22nd at 7 p.m. EST to talk about my new book, Fairies, Pookas and Changelings: A Complete Guide to the Wild and Wicked Enchanted Realm. Do you believe in the occult intellectual power of goats? An American journalist, born in the 1830s, William Wirt Sikes did. Or at least he believed it was necessary to record this belief along with other fascinating “old ways” of the Welsh people as he traveled there as consulate, and never left. Many of us have an immediate association with goats and Baphomet or another horned god, seen cavorting with witches at the sabbat, and dancing around the bonfire at all hours of the night. (Yes, please). But Sikes is talking about a more specific relationship: that of goats with the Gwyllion: female fairies with “frightful characteristics, who haunt lonely roads in the Welsh mountains, and lead night-wanderers astray.” These wild goblin women (which remind me a bit of the banshee) lurk and loom in craggy mountains and behind the shadows of boulders. 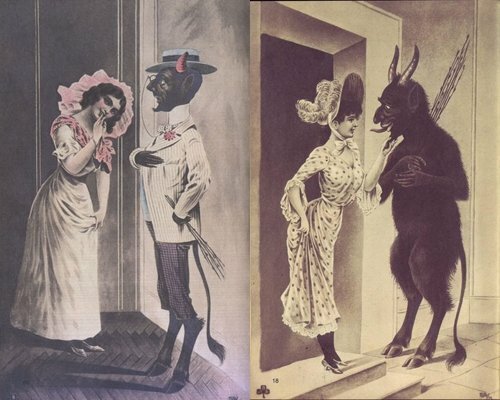 The Welsh word “gwyll” Sikes tells us, is used “to signify gloom, shade, duskiness, a hag, a witch, a fairy, and a goblin.” In this excerpt from his greater work, British Goblins, we learn the story of a goat who did not transform into a man but rather a beautiful maiden who seeks to avenge a man’s anger. Among the traditions of the origin of the Gwyllion is one which associates them with goats. Goats are in Wales held in peculiar esteem for their supposed occult intellectual powers. They are believed to be on very good terms with the Tylwyth Teg [the common Welsh name for all fairies. V.V.] and possessed of more knowledge than their appearance indicates. It is one of the peculiarities of the Tylwyth Teg that every Friday night they comb the goats’ beards to make them decent for Sunday. Their association with the Gwyllion is related in the legend of Cadwaladr’s goat: Cadwaladr owned a very handsome goat, named Jenny, of which he was extremely fond; and which seemed equally fond of him; but one day, as if the very devil possessed her, she ran away into the hills, with Cadwaladr tearing after her, half mad with anger and affright. At last his Welsh blood got so hot, as the goat eluded him again and again, that he flung a stone at her, which knocked her over a precipice, and she fell bleating to her doom. Cadwaladr made his way to the foot of the crag; the goat was dying, but not dead, and licked his hand—which so affected the poor man that he burst into tears, and sitting on the ground took the goat’s head on his arm. The moon rose, and still he sat there. Presently he found that the goat had become transformed to a beautiful young woman, whose brown eyes, as her head lay on his arm, looked into his in a very disturbing way. ‘Ah, Cadwaladr,’ said she, ‘have I at last found you?’ Now Cadwaladr had a wife at home, and was much discomfited by this singular circumstance; but when the goat—now a maiden—arose, and putting her black slipper on the end of a moonbeam, held out her hand to him, he put his hand in hers and went with her. As for the hand, though it looked so fair, it felt just like a hoof. They were soon on the top of the highest mountain in Wales, and surrounded by a vapoury company of goats with shadowy horns. These raised a most unearthly bleating about his ears. One, which seemed to be the king, had a voice that sounded above the din as the castle bells of Carmarthen used to do long ago above all the other bells in the town. This one rushed at Cadwaladr and butting him in the stomach sent him toppling over a crag as he had sent his poor nannygoat. When he came to himself, after his fall, the morning sun was shining on him and the birds were singing over his head. But he saw no more of either his goat or the fairy she had turned into, from that time to his death. Join me and Chris Fleming on his show Spirit Talk as we share weird Christmas stories and Christmas traditions and creatures from around the world, from the benign to the terrifying. The perfect thing to listen to while you’re wrapping all those presents! Chris is a fascinating man who has had paranormal encounters and experiences since a child. He is a medium, sensitive, paranormal investigator with a long standing career on television and radio. It was a delightful show to be part of and I hope you enjoy it! Should auld acquaintance be forgot…don’t forget my face! LIVE on Beyond Belief on Gaiam TV. Come nurse your hangover with a little cure for what ails you: my peeling laughter and wicked antics. Here is how it works. Click this link. On January 1st, this link will take you directly to the show. Before then, the link takes you to the main page for Beyond Belief, but once the show airs it will remain the direct link to my episode. If you want to watch it YOU MUST SUBSCRIBE. You can get a FREE 10-DAY TRIAL, and watch it any time or as many times as you want during that 10 days, plus any of the other episodes! After the 10 day period if you want to keep watching it, because you want to wake up to/fall asleep to the sound of my voice throughout the year, you have to sign up to GaiamTV. Once you’ve signed up for the 10-day trial, you can stream the video of me and George yukking it up over vampires, banshees, a little bit of Crowley, and other delightful horrors, through your computer, tablet, phone, etc. Here’s a little info about the show! Banshees, werewolves, and mermaids are all the stuff of fantastical legends stretching beyond the limits of recorded history. But what if there was some truth to the tales of these mysterious creatures? 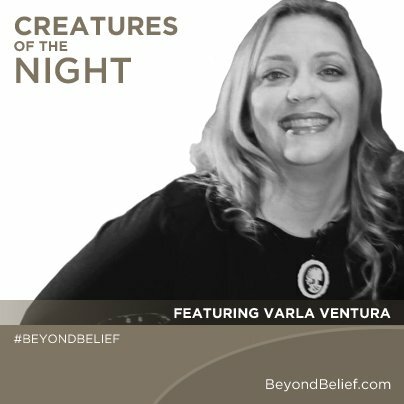 Author Varla Ventura’s passion is researching the bizarre and she reveals the truth behind the legends of several creatures of the night in this interview with George Noory originally webcast January 1, 2014. 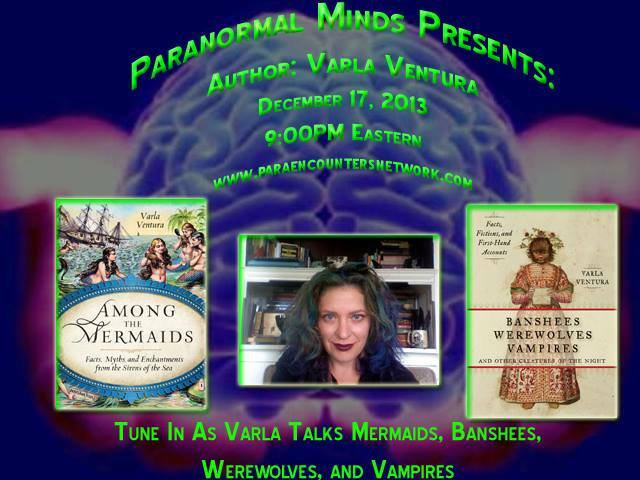 Varla Ventura is a lover of all things strange, freaky, and terrifying. She is the author of Banshees, Werewolves, Vampires, and Other Creatures of the Night and curates the Weiser Magical Creatures and Paranormal Parlor series of e-books. When not burning the midnight oil writing about weird news for her Blog of the Bizarre, she can be seen traversing the hidden cemeteries and phantom ships in the greater Bay Area. She can be found online at www.varlventura.com. Don’t I look like a happy little freak? See more of me than you ever thought you wanted to. A Melding of the Paranormal Minds: Tonight! Live! Greetings you little elves and gnomes and hobgoblins, ye’ merry creatures of the night. Tune in tonight at 6 pm PST/9 PM EST for a delightful hour of the paranormal persuasion. I’ll be a guest on Paranormal Minds Radio. You never know where the conversation will lead, although I can guarantee you will probably want to double check your locks after. Greetings guys and ghouls! I’ll be conversing with the great George Noory tonight, Wednesday the 17th, on Coast to Coast AM and I hope you can join us! The show starts at 10pm PST , and I’ll be on at 11PM PST. We’ll be discussing mermaids, and other strange and mythical beasties, banshees, and things that howl and bump in the night! Click the link below to find out what stations will be airing the show. If you are a subscriber you’ll get it as a podcast too. 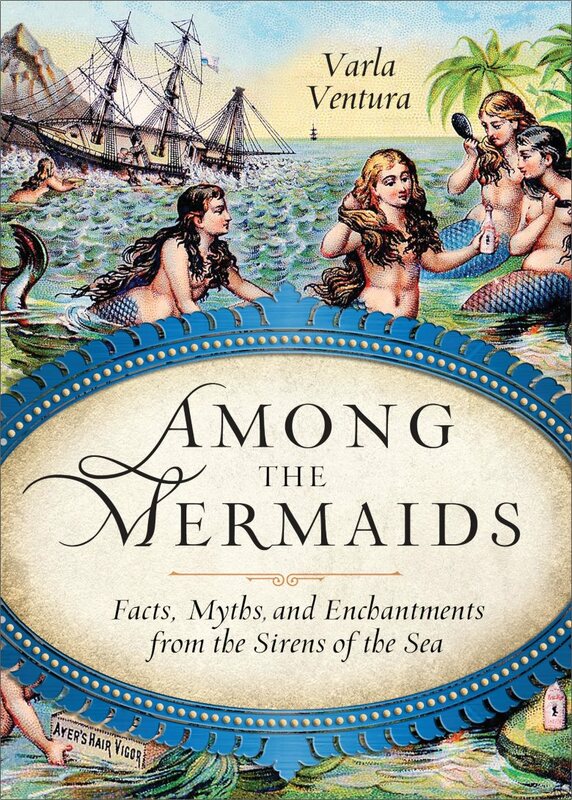 Check out my new book, Among the Mermaids: Facts, Myths and Enchantments of the Sirens of the Sea. and keep your eyes here for special give-aways, Varla-approved book trailers, mermaid swag and other goodies. Saturday Night Special~Church of Mabus! Hey Freaks! Whatcha’ doin Saturday night? Want to get into the “spirit” of Christmas? Join me on Church of Mabus radio. Hosts Jeffery Pritchett & Erica Goetsch are ripe and ready to discuss Christmas trolls, Krampus, terrifying creatures of the night, little men you should beware of, freaky facts, dark and strormys and so much more! And if you aren’t up for the night (pathetic! you fall asleep sooo early these days!) you can listen to the archived show the morning after. Or sometime to follow that. So if you’re worried that that isn’t Santa scratching on your rooftop, join me. It probably isn’t. And it aint’ the wind, neither. After recently reading and reviewing Reginald Bakeley’s Goblinproofing One’s Chicken Coop, I scored a very interesting interview with this man that loathes the fairy kingdom. He believes that fairies are actually pernicious, malevolent, and dangerous. Famed gnome-hunter, fairy-cattle herder, and goblin-banisher, Bakeley shares what he’s learned over years of adventures with these “unnatural” creatures in his book. I thought I’d catch up with him and get some questions answered, in case any of you were as uninformed as I once was about the fey. It’s a tricky question, that one, because each sort of fairy has its own way of mucking things up. I’m tempted to point the accusatory finger at the pixie, but they strike only whilst one is trying to enjoy a walk out-of-doors. There’s another, more pernicious sort, who dwells much closer to home. I’m speaking of the common house brownie. He seems innocuous enough, doesn’t he? A little manikin bopping around of an evening filling all the coal scuttles and sewing the buttons back on shirts. But that’s his game, see? The brownie’s a social climber, and that sort of behaviour in a fairy is incredibly dangerous. If allowed to ingratiate himself with you through his wheedling industriousness, the brownie will invariably convince you that he—a little fairy and nothing else—is as good as any human. From there it’s a short journey to the brownie’s assuming an attitude equal if not superior to the householder. Master becomes servant and servant becomes master and the whole world’s gone topsy-turvy. It’s insidious behaviour, and given the relative saturation of the brownie population throughout Britain—and in areas of New England in the Colonies as well, I’ve learned—many, many people need to be aware of it. Have you ever had your own home inhabited by a brownie? I must admit that, yes, my ancestral home of Bakeley Hall in Pembrokeshire has been seized by a brownie lodger more than once during my life there. Rural homes seem to attract the blighters more readily than homes in town, and of course the brownies thrive anywhere there is plenty of tea and laundry. Bakeley Hall is such a place, and so I should never be surprised to discover evidence of nocturnal brownie activity. All the same it’s damned disconcerting to get out of bed and put one’s foot squarely into a large bowl of steaming porridge garnished with cream, walnut halves, and pomegranate seeds. If it’s ever happened to you—and I hope it hasn’t—you’ll know what I mean. Brownies will fill one’s entire house with bowls of porridge unless one strikes back immediately. Did you simply drive him out, or were you able to use his ambitions against him and trick him into midnight housecleaning? I’m not a man to toy with the Faerie realm. I prefer the direct approach, frontal assault. In the case of beating back a troublesome brownie infestation this usually means going round to the stationers or the Savile Row tailors, for means of brownie-abatement I detail in my book. It’s never an inexpensive operation, but what price can we put on piece of mind? You know the perils of being involved in the fairy world, but your knowledge has allowed you to dedicate your life to hunting these pernicious creatures. If you could, would you give up your Second Sight and live a “normal” life? In an instant, yes. I’ve often thought of taking up cheese-rolling. You write that the changeling egg of a goblin once turned a young girl’s legs backwards. What is the strangest curse you’ve ever encountered? Ah yes, poor Ettie Ungerslud. We can draw strength in our campaign against the Fairy Kingdom every time we think of her and how she always wears very full skirts these days. Hers is an unfortunate curse, but as for the strangest, I’ve been surprised and dismayed in recent years to find instances of what might be categorized as “half-curses.” Instead of a classic fairy curse that turns a victim into a goose, for example, we see people touched by the fairies who now exhibit mere gooselike behaviour. Offenses which under usual circumstances would have blinded a fairy’s victim now produce a blindness which comes and goes. My research is as of yet inconclusive, but I’m beginning to suspect that these “half-curses” are coming about either because the fairies’ magic is weakening or people are growing a stronger resistance to the fairies’ meddling ways. One might take either of these possibilities as good news, except for the fact that there are no tried-and-true methods for reversing half-curses. It used to be that an angry fairy might whisk away a lover to a desert island, and the grieving partner remaining would have to travel there to rescue him or her. But what’s to be done when only a portion of the lover is transported? It’s most distressing, and the growing number of half-curses I’m seeing can hardly be called progress in our fight against the fey. I’m working on a book about mermaids, and I noticed that in your youth, you had a tragic love affair with a mysterious woman. Was she a mermaid? Who? You mean Cordelia? I’d never thought of it that way. Hmm. In Goblinproofing One’s Chicken Coop, you enumerate the benefits of flower-fairies in the garden and fairy livestock on the farm. What are some of the other benefits of discovering fairies? Those two instances are special cases, for the most part. Flower-fairies and fey livestock are inherently useful in their own, limited ways, but broadly speaking the discovery of a fairy is beneficial only in that it gives one an opportunity to squash it, thereby reducing the fey population and lessening the trouble they bring to mankind. There are quite a few edible fairies flitting about, and some are downright scrumptious. I’ve got a weakness for pansy-blossom sprites on toast, for example. As with any sort of foraging, though, it pays to know precisely what you’re looking at. Eat the wrong fairy and anything could happen. I haven’t yet found a field guide thorough enough for using when hunting edible flower-fairies. I’d suggest beginners stick to gnome hunting, as those fellows aren’t as easily mistaken for anything else. What is the best way for a novice to begin gnome hunting? As with any straightforward countryside pastime, it’s best to find others who’ve been at it for a while. Follow their lead. If you weren’t raised in a family boasting a long line of gnome hunters, though, it’s easy enough to take it up on one’s own. I present it all in a very clear manner in my “On Gnoming” chapter in Goblinproofing, and I’ve also produced a small pocket guide strictly on the subject, available through Wonderella Printed and a few sympathetic outfitters here and there. 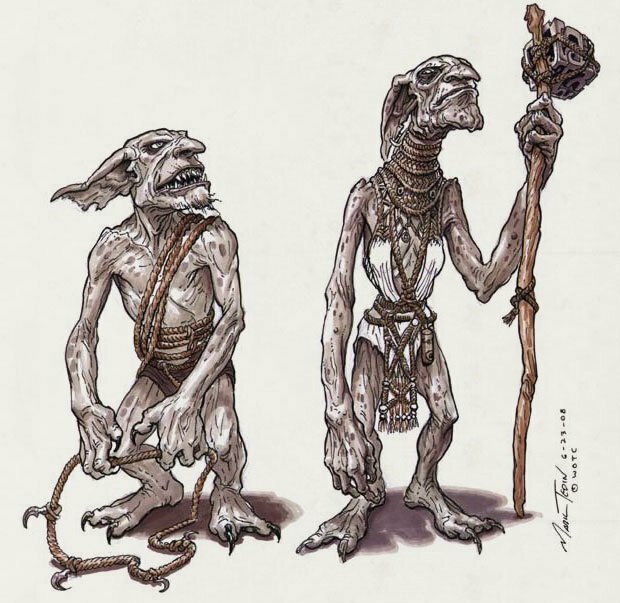 I learned the unsettling facts about trolls from Goblinproofing—their incredible strength and massive appetites and the single comforting detail, their weakness for solving riddles. In case any of us should have the misfortune to run across a troll, do you have any tried-and-true riddles to offer for our protection? A troll doesn’t stand a chance against a clever riddle. Its faculty for logic inhabits the lowest rung on the biological ladder, cozying up with that of the Mollusca Class Gastropoda, which incidentally is a favored food of trolls. Nearly any riddle will do, but you must deliver it with conviction. Clap your hands once loudly and shout, “What ho, troll! Answer this riddle and I’ll fetch a rowboat full of snails for you to eat!” That will capture his attention. It’s no bother if you haven’t the foggiest notion where to find a rowboat, or snails. You won’t need either, because the troll won’t ever answer your riddle. He’ll either sit there thinking over possible answers until the sun comes up and turns him to stone, or he’ll strain his feeble brain until the pressure explodes it. It’s worth sticking around to watch either eventuality, just for the spectacle of it all, but I don’t recommend keeping your shooting coat once it’s covered in bits of troll. The stains—not to mention the stench—simply will not come out. What would you recommend for an anti-fairy emergency kit? It’s funny you should ask that, because I’ve been assembling several such kits for my local rambling chapter. So far I’ve thrown in a flask of whisky, a cat’s eye marble, some doll’s house furniture, an iron nail, an alarm clock, and an O.S. map. Anyone who reads Goblinproofing One’s Chicken Coop will appreciate the assemblage.